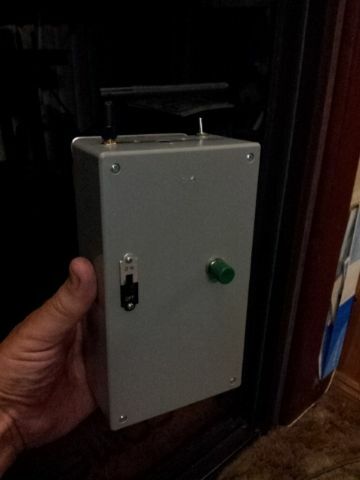 I've given up looking for an old single channel radio, so, I built one. What I need now is just the rubber powered escapement, my single channel radio works fantastic using a servo that emulates the actions of an escapement. Mastering the button was a challenge, but I figured it out, I've even learnt to barrel roll on rudder only and done one almost loop. Anyway, I there is anyone out there with a spare compound escapement like a Babcock MK11 or similar working or not, I would like to purchase one or more? If it's not working I will restore it or use it to make my own, I just need one. This is my home made single channel transmitter. Did that have a kick up elevator Dave? I still have a Fred Rising clockwork escapement that I used for throttle control with my old McGregor two channel proportional that Bruce was on about in his video, full down (or was it up) triggered the throttle from full to idle via a micro switch. That was before I discovered there were holes in the McGregor board for extra components that would make it a three channel, then I made an extra add on on veroboard and made it four channel! Would that be of interest? The Babcock MK11 had an electrical contact near the rubber hook that when you pushed the button three times and held, the contacts touched as power is supplied and the elevator kicked up using the second escapement. That was as far as I got using the MK11, as to how to get it to work a throttle I don't know. I think a kick up elevator could also be incorporated into the MK11 with a second lever from the side that worked with the rudder not separately, I think. My home made gear can operate three functions, rudder, elevator and throttle, I've only used rudder and throttle so far. Eight flights and I missed the field once (wind picked up half way through the flight) and every landing on the wheels. I'll post a few pics in a different thread later. Dave,I have an OS S-2 escapement if you're stuck.I don't know if it works though.Is there an easy way to test it without destroying it? Im in nz,so possibly closer than others.You could have it for the cost of postage,assuming it works.Hans. Thanks, I'll take it working or not, I'll make it run. If you can tell me the postage to Sydney OZ, I can paypal the money to you, if thats Ok with you? It will be treasured and used, I have servos 30 years old still being used in competition gliders. It looks as though you could recreate your own, with a few bits of tinplate, some gears and springs, and a solenoid that might be an interesting little project. That's what I want to do if I can't get a working one, I just need one working or not to use as a pattern. I wish I had kept the C &S single channel set I had back in the early 70s, it had a Babcock MK11 with it, didn't have anyone to learn from back then. Now, with the knowledge I have acquired since then, setting up SC aircraft and RC gear is a simple thing, getting the RC gear is hard. Lucky I have a good quality transmitter and receiver (2.4Gig) I can fit an escapement or two as well as servos and an ESC if I go electric. hey is that the module i sent ya a few weeks ago your using ? http://www.singlechannel.co.uk/ . What I need for that is a pulse actuator. and flew an RCM & E Timber with it for about 45 flights. The mighty midget motor of which I had two (also thrown away long ago) powered the flapping bits. Seems like you have a serious case of nostalgia, I can understand it but I can't share it!